Come with me and experience the adventure of a lifetime! Explore the lands and cultures of thirty-six countries. Interact with crews of thirteen U.S. Navy warships as you traverse the oceans of the world. Watch how the ships’ personnel earn college credits under the little-known Program for Afloat College Education (PACE). Ride with the Marines as they enter Iraq during the first Persian Gulf War. Witness some behind-the-scenes that made worldwide headlines from 1989 to 1994. Written as a journal and illustrated by nearly 200 color photographs scattered throughout the text, the book gives the reader the sense of being alongside the author to vicariously share his experiences of a lifetime. Five Years at Sea is a fast moving, first hand account of events that made world-wide headlines, taking you from San Diego to Shenzhen--and just about everywhere else you can imagine and puts you right in the middle of shipboard Navy life. If you enjoy tales of unimaginable adventure, military intrigue, and cultural encounters, you'll want to spend serious time with this book! James Lee has written the book that all of us who enjoyed our Navy careers wish that we had written. As one of the individuals who went to sea with James Lee, I can assure you he has captured the parts of the journey we both shared with amazing clarity. 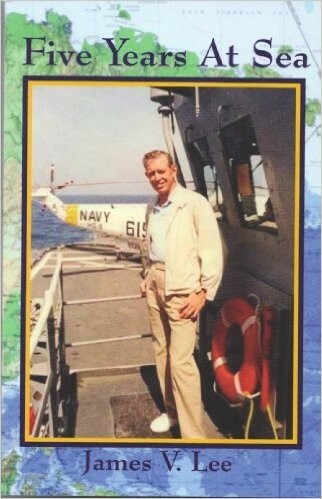 The adventure of foreign ports and their unique culture, the challenges at sea, and the most meaningful part of being a Sailor--that of camaraderie and teamwork with your shipmates--are described with such accuracy that I relive that deployment again through his words. Just as Richard Henry Dana wrote about life at sea in the age of sail, Jim has captured the day to day life at sea in the modern age. What an adventure! This book is rich in adventure, beauty, and human interaction. I recommend it highly, especially to those who admire a strong individual with a soft touch.